Watch a video of students unboxing musical instruments and playing them here! ¡Mire un video de los estudiantes desempacando instrumentos musicales y tocandolos aquí! 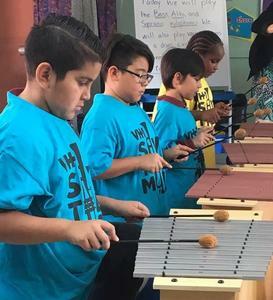 A new instrumental music program launched this school year at Sweeney and Natchaug Schools! VH1 Save The Music Foundation and Jeffrey P. Ossen Family Foundation are funding this major program to excite students about instrumental music instruction with brand new xylophones, guitars, pianos, and drums. The plan is to expand the offering to also benefit other Windham elementary schools in the next few years. ¡Un nuevo programa de música instrumental se lanzó este año escolar en las Escuelas Sweeney y Natchaug! VH1 Save the Music Foundation y Jeffrey P. Ossen Family Foundation están financiando este importante programa para entusiasmar estudiantes sobre instrucción de música instrumental con nuevos xilófonos, guitarras, pianos, y tambores. El plan es ampliar la oferta para que otras escuelas elementales de Windham también se beneficien en los próximos años.